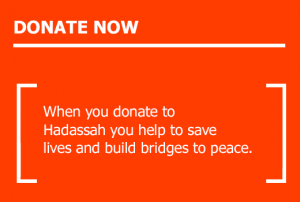 In the last year, here’s some of what’s been happening at Hadassah Medical Center. Stem cell research breakthroughs in multiple sclerosis. Clinical trials dedicated to defeating ALS. A new approach to treating Alzheimer’s disease. These successes are only possible because of you. These and other advances rely on a consistent flow of funds dedicated to research. With a contribution of $99 or more, you can continue your commitment to our Research in Service to Humanity Campaign. The people around the world whose lives are being saved by this research thank you for your support.